While not grown commercially in Texas, pomegranate trees can grow in the state and perform best in south, central and southeast Texas where the climate is warmer. Plant pomegranate trees in the spring when the soil can be worked and frost danger has passed. 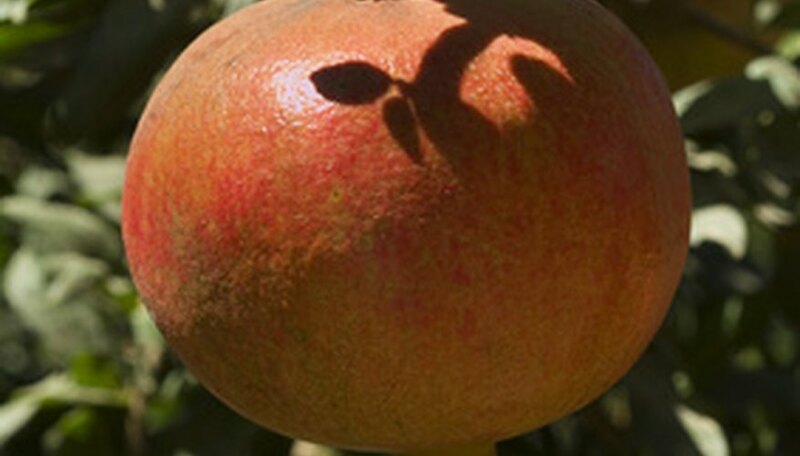 The fruit can be damaged by temperatures of 18 to 10 degrees F. Pomegranate trees have globular fruit and reddish-orange flowers, providing ornamental as well as culinary interest. Choose a site for your pomegranate tree that offers full sun and well-draining soil. As the University of Texas notes, pomegranate performs well in both slightly acidic soils and the alkaline soils common in south Texas, which means that Texas gardeners won't have to modify their soil pH before planting. Dig a hole twice the size of your pomegranate tree's root ball, removing rocks, weeds and roots from the hole. Then pull your pomegranate tree from its container. Work out the circled and tangled roots by running young fingers through them until all roots are free-standing. Check for broken roots; trim these back using pruners. Place the pomegranate tree in the prepared hole. Holding the trunk straight with one hand, fill in the hole with soil with the other. Firm the soil gently around the tree trunk. Water the newly planted pomegranate tree until the soil becomes saturated and compresses around the base of the tree. Water every three to four days for the first few weeks after planting. Then, decrease the watering to twice weekly, then once a week. Each time, water until the soil becomes saturated. A well-established pomegranate tree needs water every seven to 10 days, notes Texas A&M University. Prune away suckers growing from the tree trunk with anvil pruners. Also prune away dead or damaged branches, limbs that crisscross other limbs and branches that grow vertically. Prune annually in the late winter, once frost danger passes, but remove dead or damaged wood whenever you notice it. Fertilize the pomegranate tree twice annually, in November and March. Apply 2 lbs. of 8-8-8 fertilizer while the tree is young. When it begins to bear fruit, switch to 4-1/2 to 6-1/2 lbs. of 8-8-8. Use a water-soluble fertilizer or scatter dry fertilizer around the base of the tree, then water the soil to work the fertilizer into the ground.